Management forecasts dividend growth of greater than 6% per year through 2020 at least. 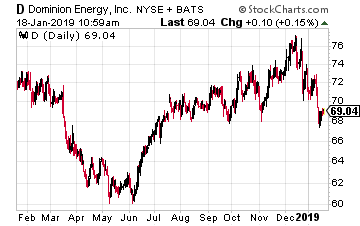 As a final benefit, utility stocks are viewed as some of the best investments in an economic recession, so as the economy gets works, utilities like Dominion Energy will become more popular with investors. The stock currently yields 4.8%. The defensive appeal of Easterly Government Properties (NYSE: DEA) is that the company’s properties are 100% leased to U.S. Federal government agencies. This REIT is growth focused, with a business plan to steadily acquire facilities needed by those agencies that are also growing, such as Veterans’ Affairs, the FBI, and Homeland Security. Since its early 2015 IPO, the company has increased its owned properties by 150% to a current 65. New properties go on long-term leases with selected agencies. Leases have built in rent escalators. Since the IPO Easterly Government Properties has increased its quarterly dividend six times. Going forward investors can expect 4% to 6% annual dividend growth. The stock currently yields 6.1%. 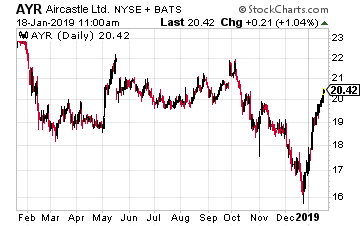 Aircastle Limited (NYSE: AYR) is distinguished from most higher yield stocks by the tremendous cash flow coverage of the current and growing dividend. The company owns a fleet of about 200 commercial aircraft that are leased to airline companies around the world. Over the last year Aircastle has paid dividends of $1.14 per share against earnings of $2.59 per share. In addition, the bottom line EPS under-reports free cash flow per share by at least 50%. 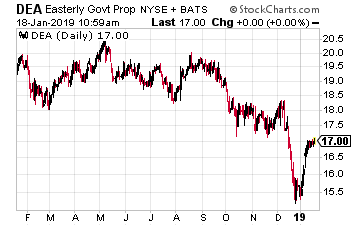 As a result, this stock has much better cash flow coverage of the dividend compared to pass-through companies like REITs that must pay out 90% of net income as dividends. You can expect AYR to grow the dividend by 7% to 9% per year. The shares yield 6.0%.